We try to understand the problem with our world, and with us. 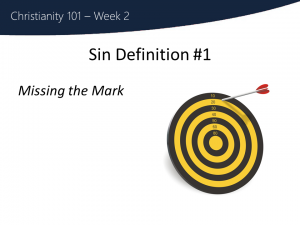 We look at one definition of the word “sin” as missing the mark or target.Today’s topic is sinI know this is a word that carries a lot of baggage, many of you have heard it before, and probably have some negative experiences around it. You’re not alone, watch a quick video of people’s reactions to this word, and then discuss it with your groups. Now that we have all shared our experience with this word, we’ll look at what it really means. It’s important that we do this, so we can fully understand God’s plan for our world, ourselves, and our relationship with him…and that something very real is blocking our way. As we mentioned in the first week, we do live in an absolutely beautiful world, but that is only half the story It is pretty hard to avoid the conclusion that there is something wrong with the world. According to the Christian faith, the biggest problem in the world has to do with us, and it has to do with something called our sin. Yet the concept of sin is offensive or ludicrous to many. This is often because we don’t understand what followers of Jesus mean by this term. And I would like to unpack it a little with you and try to get beyond the negative baggage that I freely admit the word carries. The first definition comes from the actual word sin, used in the New Testament. We think of it as a religious word, but in the original Greek language, it was a word from the sport of archery. To miss the target was to sin. Imagine a Greek archer shooting arrows…I sinned! Ahh, I sinned again, and again! I meant to hit the target, and I missed. A small example from my life is my doublemindedness around my favourite activities. Honestly, that’s pretty dysfunctional—saying one thing and then immediately doing the opposite. I miss the mark. I’m not living the healthy, intelligent, balanced life I know I could be living. In a bigger sense that dysfunctionality, when it applies to the entirety of our lives, is what followers of Jesus call “sin”. I gave you a rather trivial example but that “missing the mark” is actually quite wide and varied. If I were to put up on little yellow post it notes all around this room, every thing that I have ever done, ever said, ever thought, or ever forgot to do or say, I would feel naked and humiliated in front of you. The apostle Paul, one of the writers in the New Testament, summed it up as this “All have sinned and fall short of the glory of God.” Note first the obvious connection to archery, the arrow Paul meant to hit the target didn’t go far enough, it fell short and missed the mark. Note also who Paul is comparing us to—the glory of God. When we talk about sin, we like to compare ourselves to axe murderers or child molesters or Hitler, and we will usually think we come off quite well. But when I compare myself to God Himself, I fall incredibly short too. How have you thought of sin in the past? What images or words does “sin” conjure up?